The Iomega Jaz Drive is a removable hard disk drive that was introduced in 1995 and had a relatively short lifetime. The production of new drives stopped in 2002 as higher capacity, more convenient, and more cost effective storage media gained popularity in the marketplace. The Jaz drive is different from normal hard disk drives found in desktop or laptop computers because the disk and drive are two separate entities. In normal hard drives, the disk or disks are contained inside a sealed case and the case contains all the mechanical components to make the hard disk drive function. This hard drive case is then installed inside of a computer or connected via a USB or Firewire connection to the computer. For the Jaz drive, the 3.5-inch hard disk or disks are found in a cartridge and the mechanics to read the disks are in the drive component and not in the cartridge. The hard disk cartridge needs to be inserted inside the drive bay for the disk to be read. The actual Jaz drive is connected to the computer via a Small Computer System Interface or SCSI. The image that follows is a 1 GB Jaz disk cartridge. The top of the cartridge contains a slider that is opened as the cartridge is inserted into the Jaz drive so that the magnetic heads can read or write to the disk. 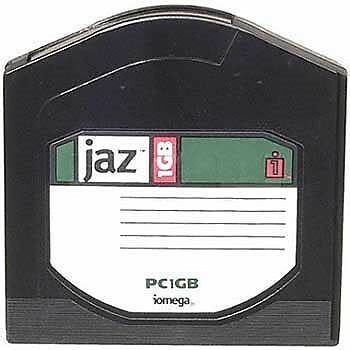 The first capacity of Jaz disk was a 1 GB disk cartridge and later in 1997, a 2 GB disk cartridge was introduced. The drives for the 1 GB disks are not compatible with the 2 GB Jaz disks, but the 2 GB drives are compatible with both removable hard drive formats. At the time, these were very high capacity removable disks and were much more useful for dealing with larger files than the Iomega Zip Diskettes. In particular, Jaz hard disk drives were used to exchange these larger files with other individuals and for backup of large files on computers. In addition, because the Iomega Jaz Drive is a hard disk, it can be spun faster than floppy diskettes such as the Zip or other floppy disk formats. This means that data retrieval is quicker with Jaz disks than with floppies. Iomega Jaz Drives tended to experience more problems than typical hard drives. This is because normal hard drives, as indicated previously, are housed in a sealed case and there is essentially no contamination of the hard disk surfaces. Jaz disks are not as well protected in the cartridge casing and the surface of the hard disk eventually is contaminated with dust and debris causing the read heads to crash on the surface of the disk leading to loss of the disk and information stored on it. Any information stored on Iomega Jaz Disks should be transferred to a new format immediately, if working Iomega hard drives can still be found and connections to modern day computers can be made. Finding a working drive may be an issue considering the limited popularity of the format in marketplace and only seven years of production. Otherwise, older computers with the proper connections and operating system may have to be used if they can be obtained. Generally, hard disk drive formats have short longevities because the mechanics of the system fail.